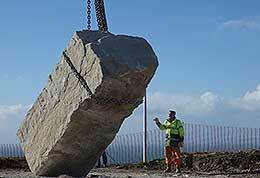 Brighton celebrates long-standing relationship with Portland Quarry as their latest project is raised for the Summer solstice. The Portland Sculpture and Quarry Trust have had a close relationship with University of Brighton sculptors, sound artists and architects since the 1980s. Their latest project raises a monumental stone circle at the quarry, at the same time raising questions about how art and landscape can conjoin and how we understand our environment. Jane Whitaker, artist and academic in the School of Art, is working closely on the current project and organising a celebratory seminar at the University of Brighton at the end of April, recognising the work of the university in this valuable partnership. The installation of 12 of the largest stones sourced from opencast quarries will create a platform for the sharing and exchange of knowledge between artists, geologists, architects, ecologists, quarrymen and industry. The stones will bring a curatorial role into landscape through a digital archive as the first phase of a larger project establishing new cultural routes through Portland Quarries Nature Park that re-enage artists' work, process, research and practice. This long-term project on the relationship between sculpture and landscape has widened the context of site specific work across University of Brighton departments, creating interdisciplinary connections to the social, enviornmental, historical and cultural context. The diversity of experience and exploration provided between the Portland Sculpture & Quarry Trust and the staff and students at the University of Brighton has proved the success of a new model for regeneration based on a principle of interdisciplinery exchange within the enviornment. This has created a new platform for experimentation to progress collaborative research between the arts, science and humanities. Tout Quarry was saved from further mineral extraction through artists work in 1983, creating a contemporary context that addressesd the wider issues of our environment. Artists included University of Brighton former tutor Antony Gormley who incised a lifesize figure ‘Still Falling’ into the living rock face. This takes in the whole cross-section from orginal landsurface through 150million years of the fossil record, and makes reference to man causing nature to fall. The opportunity for University of Brighton students to be part of the PSQT development over several years has extended their practice across subject areas as a proving ground for innovative ideas, gaining an understanding of new uses of materials and issues of environmental sustainability, with study at undergraduate level and one year MA by Independent Project. The Trust provides routes to taking forward individual and group work at the Drill Hall Project space where artists and other researchers can create, test out and present new work. Positioned at the meeting point of 11 contrasting quarry environments that form the Portland Quarries Nature Park - an environment that is a network of abandoned and disused quarries full of wildlife, heritage and industrial archaeology. The building and environment offer opportunities for the public, artists and students to recognise the intimate relationship that sculpture has with landscape, where the site brings them them into contact with the quarrying history and developing their understanding of materials, their source and their form. Visit learningstone.org for further details and contact.